Delal’s father, a teacher at the BDP academy and accused of membership of a terrorist organisation, is still in jail. He has diabetes and wanted to go for a hospital check-up without handcuffs, but that right was not granted to him. Also still in jail: my colleague Turabi, prosecuted in the KCK case because of his writing. The families of the victims of the Uludere massacre are still waiting for the truth to come out and to get a sincere apology. The Saturday mothers, whose sons and daughters disappeared, most of them in the nineties, are still looking for their children and demanding an answer to what happened to them. Kurds still don’t have a say in governing their own lands, and still don’t have a rightful place in the Turkish constitution. So why a cease fire? Beats me. Don’t get me wrong, it’s not that I am against a ceasefire. The less people that die, the better. But I am trying to understand why it happened, and frankly, I just don’t get it. I remember last year at a press conference, BDP co-chair Gültan Kisanak said: ‘Have you ever seen an armed organisation with a political goal laying down its arms before any concession is made on the other side?’ I could understand that. But now, I’d like to raise my finger: yes, I do know such an organisation! Woman holding a flag with Öcalan’s portrait, Newroz, Diyarbakir, 21 March 2013. Pic by me, click to enlarge. I know, this is a ceasefire and not a surrender of weapons. You could say Öcalan is playing it smart, forcing Erdogan’s hand like this. And if the government doesn’t keep its word, the PKK can always take up arms again, right? Wouldn’t that, after giving people hope of an end to all the bloodshed and pain, be the biggest deceit of all? Öcalan’s call for a ceasefire – that you can read here in English – sounds not easily reversible to me, with sentences like ‘Let the guns be silent, while opinions and politics speak’, and ‘it’s not the end of our struggle, it’s the start of a new sort of struggle’. If this is not a sick game that will eventually only re-start and intensify the armed struggle, then it must be that Öcalan trusts the state. Based on what? We don’t know. But it seems very unlikely that he got any guarantees from the state about any major Kurdish demands. Erdogan is not a dictator who can implement a liberal, pluralistic constitution just because he wants to, or who can demand a more federal system of government for Turkey. He has a voter base and a parliament to take into account. The only thing that’s possible is a deal on the constitution: Erdogan gets his way with the executive presidential system that he wants before the presidential elections next year, and the BDP, instructed by Öcalan, settles for getting some demands met. I explicitly say ‘some’, because it’s impossible to implement a truly liberal, pluralistic constitution and a more federal system of government within some eight months, after which the presidential election campaign will start. But wouldn’t a compromise be good? No. The demands of the Kurds are legitimate; they have a foundation in international law and should not be negotiable. Not implementing any one of them means Turkey will still not be a democracy, which is not only bad news for Kurds, but for everybody in this country. Which can lead to only one question: can Kurds trust Öcalan? When I ask this to Kurds, it turns out they are confused. They too of course don’t know what the behind the scenes deal is, but there seems to be little room in their minds for doubting their leader. 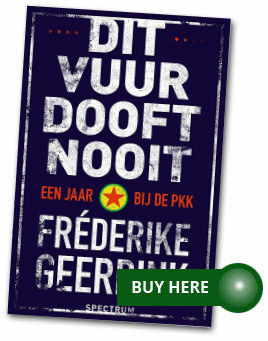 Would he let Kurds down, make a lousy deal and give up the struggle just for, for example, his own freedom? That made me think of the words of Kurdish human rights activist and MP Leyla Zana in 2010 about the armed struggle. She said: ‘The weapons are Kurds’ insurance. As long as the Kurdish issue exists, those weapons are a guarantee for Kurds.’ Öcalan has now taken away that insurance and it hasn’t been replaced by anything else, neither is the Kurdish issue solved. It’s only natural that life without insurance makes people feel insecure. In such a situation, you have only hope left, and you hold on stronger to the one person you always believed you could trust to have only your best interest at heart. I hope Öcalan won’t end up free and the Kurdish people empty-handed.